Outside Lands is taking over San Francisco’s Golden Gate Park this weekend with headliners Elton John, The Black Keys, Mumford and Sons, Kendrick Lamar, Sam Smith, Wilco, Tame Impala and more. 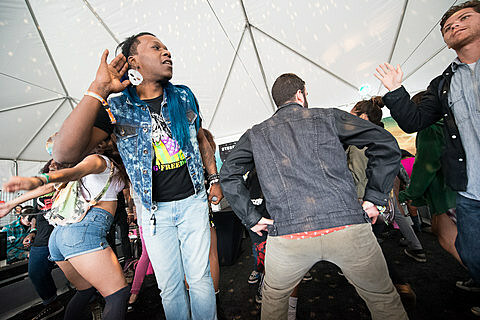 BrooklynVegan, SPIN and Stereogum are returning to the sold out festival this year with a presence in the Toyota Tent which is located in the Polo Field near the Lands End Stage. 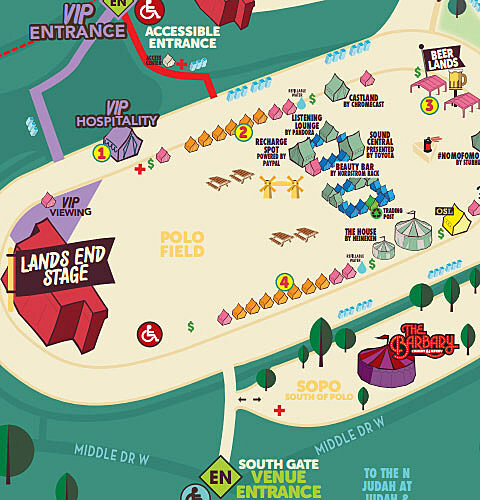 The tent is called “Sound Central” on the festival map. Like previous years, and like at Lollapalooza last weekend, the Toyota Tent will host live performances, live Q&As and DJ sets from 1-7 PM each day. Stop by to check out intimate, bonus sets by artists playing the festival (For instance, Hurray for the Riff Raff play the Sutro stage at 12:20 on Saturday. You can then see them again in the Toyota tent at 5pm the same day). BrooklynVegan’s OSL representative this year will be Jamie Granato, also known as DJ Rezound and the man behind Group Tightener. Watch Jamie interview Dan Deacon and METZ on Sunday. Come see bonus performances by Natlie Prass, Speedy Ortiz, The Drums, Django Django, Shakey Graves, Real Estate’s Alex Bleeker and more. Check out the full weekend schedule below….